Introduction: After Lt. Gen. Ulysses S. Grant broke the Confederate defenses at the Siege of Petersburg, Gen. Robert E. Lee's Army of Northern Virginia evacuated Petersburg and Richmond on the night of April 2–3 and began a retreat in hopes of linking up with Gen. Joseph E. Johnston's army in North Carolina. As the Union Army pursued, and engaged the Confederates in the Battle of Namozine Church (April 3) and the Battle of Amelia Springs (April 5), Lee discovered that his route to Danville was blocked by fast-moving Union cavalry under Maj. Gen. Philip Sheridan. His only remaining option was to move west on a long march, without food, to Lynchburg. But the Confederate Commissary General promised Lee that he would send 80,000 rations to Farmville, 25 miles to the west. 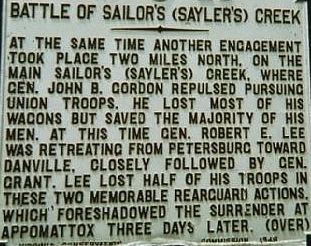 On April 6 at the Battle of Sailor’s Creek, often referred to as Battle of Sayler's Creek, nearly one fourth of the retreating Confederate army was cut off by Sheridan's cavalry and elements of the II and VI Corps. Two Confederate divisions, led by Maj. Gens. Custis Lee and Joseph B. Kershaw, under the command of Lt. Gen. Richard S. Ewell, fought the VI Corps along the creek. VI Corps attacked after an artillery bombardment. The Confederates counter attacked but were driven back at last. 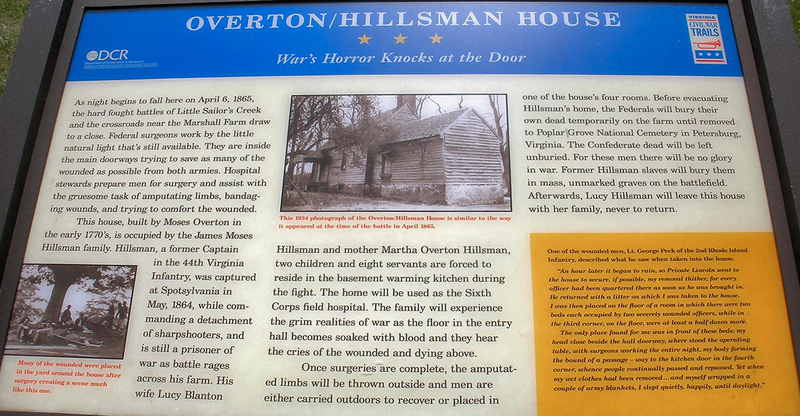 Union artillery under Maj. Andrew Cowan deployed at the Hillsman Farm played a key role in their repulse. Soon after, the Union cavalry cut through the right of the Confederate lines. Most Confederates surrendered, including generals Ewell, Lee, Kershaw, Seth M. Barton, James P. Simms, Meriwether Lewis Clark, Sr., Dudley M. Du Bose, Eppa Hunton, and Montgomery D. Corse. Col. Stapleton Crutchfield was killed leading a detachment of artillery personnel who had participated in the defenses of Richmond. 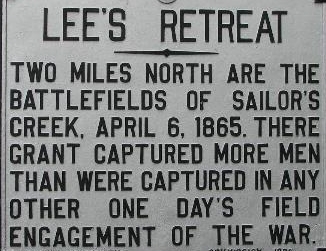 Lee would surrender to Grant just three days later. Background: On April 6, Lee's men were marching west through the rain in an attempt to reach supplies at Farmville while also placing the Appomattox River between themselves and the pursuing Union columns. 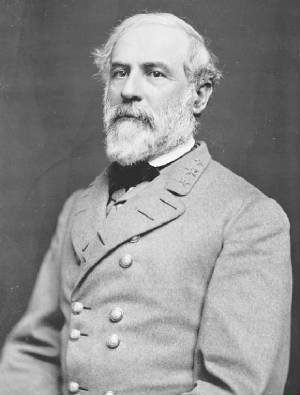 Lee hoped eventually to link up with the army of Confederate general Joseph E. Johnston near Greensboro, North Carolina. At the head of the Confederate First and Third corps, Longstreet led the march. (The Third Corps's previous commander, A. P. Hill, had been killed in the fighting on April 2.) He was followed by Anderson's small Fourth Corps, but an attack about noon by Colonel Charles Smith's brigade of Union cavalry at Holt's Crossroads—the intersection of the Deatonville and Jamestown roads—forced Anderson to stop and meet the threat. In the time it took him to fend off Smith's horsemen, a dangerous gap opened up between Anderson and Longstreet, isolating the Fourth Corps and Ewell's men who followed behind it. About two o'clock, Union cavalry under George A. Custer attacked Anderson's men two miles farther south at Marshall's Crossroads, capturing some artillery and pinning Anderson in place as two additional Union cavalry divisions approached to join the fight. Ewell, meanwhile, was being pursued by Union general Horatio G. Wright's Sixth Corps. Ewell's corps, created to defend the Confederate capital, was an ad-hoc assortment of regular soldiers, military bureaucrats, and naval personnel from the James River Squadron. When Ewell learned of Anderson's predicament, he directed the slow and cumbersome supply wagons that accompanied his forces to swing north, up the Jamestown Road, and out of the way. Gordon and the Confederate Second Corps followed to protect them. By the time Union general Philip H. Sheridan arrived on the scene to oversee the coming fight, his cavalry had already succeeded in dividing the Confederate forces between Longstreet's corps—which trekked along toward Rice's Depot, unaware of the disaster in the offing—and the rest of the Army of Northern Virginia. Now Anderson's, Ewell's, and Gordon's forces were divided again, this time from each other, setting the stage for three separate pitched battles. (Left) The Pursuit of the rebel army, April 6th-8th, 1865, and Battle of Sailor's Creek, Va. Sneden, Robert Knox, 1832-1918. In this detail from an unidentified printed map, Sneden depicts the area between Rice's Depot and Jetersville, Va. Named after Sailor's Creek that runs through Prince Edward, Amelia and Nottoway Counties, this engagement of the Appomattox Campaign was fought April 6, 1865. The Confederates sustained heavy losses (7-8,000) before withdrawing to Highbridge, and several generals, including Ewell, were captured. Sailor's Creek Battlefield with Hillsman House and Marshall Crossroads. 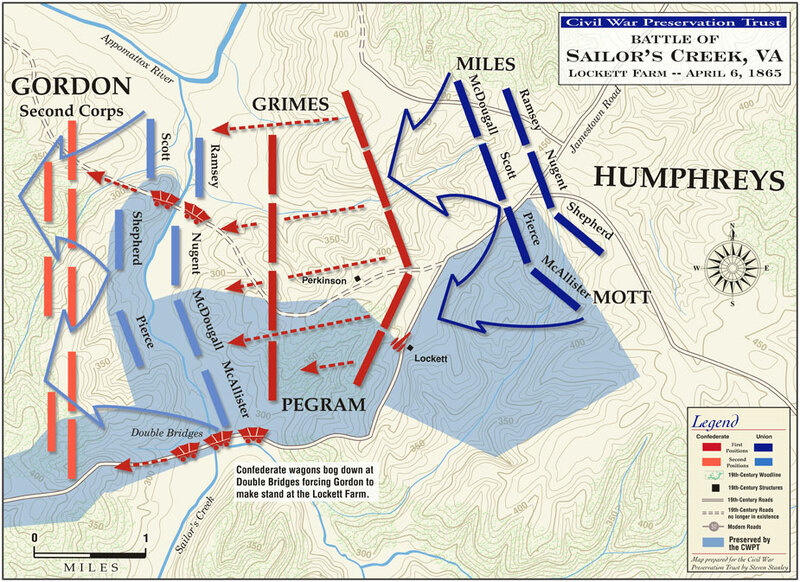 (About) Updated Sailor's Creek battlefield map with action at Marshall Crossroads to the southwest. Union and Confederate positions and movements at Marshall Crossroads and Hillsman House during evening of April 6, 1865. Digitally enhanced and enlarged by thomaslegion.net. Courtesy Civil War Trust, civilwar.org. Battle: The Battle of Sayler's Creek (also known as Sailor's Creek, Hillsman Farm, or Lockett Farm) was fought on April 6, 1865, southwest of Petersburg, Virginia, as part of the Appomattox Campaign, in the final days of the American Civil War. It was the last major engagement between the armies of Gen. Robert E. Lee and Lt. Gen. Ulysses S. Grant before the capitulation of Lee's Confederate army at Appomattox Court House three days later. The Battles of Sailor's Creek—there were three of them—were fought on April 6, 1865, part of the Appomattox Campaign on the fourth day of Confederate general Robert E. Lee's retreat from Petersburg during the American Civil War (1861–1865). Union general-in-chief Ulysses S. Grant had besieged the railroad hub south of Richmond for ten months before finally breaking through at the Battle of Five Forks on April 1. Both Richmond and Petersburg fell the next day, and Lee set his Army of Northern Virginia in retreat to the west, harassed the whole way by Union cavalry and quickly marching infantry. On April 6, a gap opened up between Confederate troops under James Longstreet and those under Richard H. Anderson, Richard S. Ewell, and John B. Gordon. Union cavalry and infantry attacked Anderson at Marshall's Crossroads. 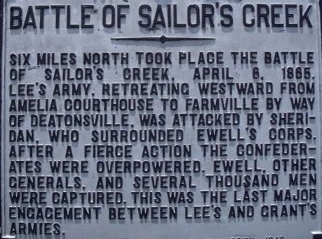 At the same time, the Union Sixth Corps attacked and overwhelmed Ewell after crossing the rain-swollen Sailor's Creek. A later attack against Gordon was stopped by darkness, but by day's end, the Confederates had suffered more than 8,000 casualties, including the capture of Ewell and eight other generals. Lee, watching from a hilltop, wondered if his whole army hadn't dissolved. He would surrender to Grant three days later. Sailor's Creek was a north-flowing tributary of the Appomattox River and, because of the recent rain, deeper than usual at two to four feet. (The earliest map found to label the creek, dated 1751, spells the name "Sailor's," but alternate spellings have included "Sayler's," "Saylor's," and "Sailer's.") After leaving skirmishers near the Hillsman Farm east of the creek, Ewell's 3,700 men crossed over to the high ground on the west side and built protective breastworks. Wright's Sixth Corps promptly chased the skirmishers back and advanced eighteen cannons to the yard of the Hillsman House, where they pounded the Confederates for twenty minutes unopposed. At about six o'clock, Wright sent two divisions totaling 7,000 men, under Truman Seymour and Frank Wheaton, across the creek and then up the hill. As they came into range, some of the Union soldiers waved white handkerchiefs as an invitation for Ewell's men to surrender. In return, they received a staggering volley of musket fire, decimating two regiments. Jubilant Confederates led by Colonel Stapleton Crutchfield—a former Virginia Military Institute instructor who had lost a leg at the Battle of Chancellorsville (1863)—chased Wright's men down the hill and across the creek. There, the two sides engaged in vicious hand-to-hand combat until Crutchfield's men were repulsed by canister from advanced artillery. Crutchfield himself was killed in the fighting. Wright's men reformed for a second assault and overwhelmed Ewell's forces, who signaled surrender by raising their musket-butts in the air. Nearly 3,400 men gave up, including five generals: Dudley M. DuBose, Joseph B. Kershaw, James P. Simms, the Fredericksburg-native Seth M. Barton, and George Washington Custis Lee. The eldest son of Robert E. Lee, Custis Lee had served most of the war as a military functionary in Richmond, including as an aide to Confederate president Jefferson Davis. This was his first combat experience. Meanwhile, eight hundred yards to the south, Union general Wesley Merritt sent his forces against Anderson at Marshall's Crossroads. (Just twenty-eight at the time, Merritt later would fight in the Spanish-American War and serve as military governor of the Philippines.) At five o'clock, three divisions of mounted Union cavalry under Custer, George Crook and Thomas C. Devin advanced on two divisions of Confederate infantry commanded by George E. Pickett and Bushrod R. Johnson. 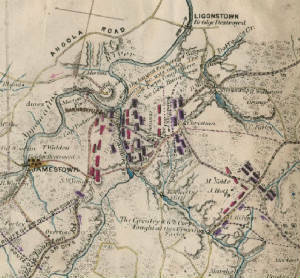 After beating back several attacks, Anderson's line finally broke and his men fled west down the road toward Rice's Depot and the safety of Longstreet's corps. The pell-mell retreat led to an additional 2,600 captured Confederates, including four more generals: Theodore Brevard, Alexandria-native Montgomery D. Corse, Warrenton-native and future U.S. senator Eppa Hunton II, and Ewell, who was returning to his men after checking on the progress of Anderson's fight. A third engagement occurred two miles to the northwest of Ewell, on the east side of Sailor's Creek and near the farm of James Lockett. That was as far as Ewell's supply wagons—protected by Gordon's infantry, as well as cavalry under William Henry Fitzhugh "Rooney" Lee, another of Robert E. Lee's sons—made it before being attacked. The Confederates had been harassed all day by the Union Second Corps, commanded by Andrew A. Humphreys, fighting delaying actions to the east at the Truly Vaughan farmhouse and at Deatonville, where Gordon lost 400 men. At Sandy Creek, Union Second Corps general Philippe Régis Dénis de Keredern de Trobriand, a French-born lawyer and novelist, took over the pursuit. At the Lockett Farm, the Jamestown Road crossed both the Big and Little Sailor's creeks over two narrow bridges known as the Double Bridges. The army's supply train made for a tight fit, became backed up, and caused a traffic jam, all of which forced Gordon to attempt to delay Humphreys yet again. Union troops formed on the high ground around the Lockett house and pressed Gordon's men back against the stalled wagons and the creek. Union general Nelson Miles's division advanced on Gordon's left flank, and the overwhelming pressure of his attack forced Gordon to order a retreat and abandon the wagons. When nightfall finally stopped the fighting, Gordon's corps suffered 1,700 men captured in addition to the loss of 13 battle flags, 300 wagons, 70 ambulances, and 400 men killed and wounded. Aftermath: Upon seeing the survivors streaming along the road, Lee exclaimed in front of Maj. Gen. William Mahone, "My God, has the army dissolved?" to which he replied, "No, General, here are troops ready to do their duty." Touched by the faithful duty of his men, Lee told Mahone, "Yes, there are still some true men left...?" (Right) Photo of General Robert E. Lee in 1863. At Sailor's Creek, Lee's army suffered the largest field surrender in American history—or at least the largest that was not followed by specific terms—and was reduced by more than 8,700 men, 7,700 of whom were captured. That equaled about 20 percent of the Army of Northern Virginia. Lee, who had been traveling with Longstreet, viewed the disaster from a distant ridge and exclaimed, "My God! Has the army been dissolved?" The following day, he relieved Generals Anderson, Johnson, and Pickett of duty, the men they commanded having largely been captured anyway. The remnants of his army, meanwhile, marched overnight the eight miles to Farmville, with their Union pursuers close behind. Union losses numbered 1,180, and following the battle, Sheridan reported to Grant, "If the thing is pressed I think that Lee will surrender." Grant forwarded the dispatch to Abraham Lincoln at City Point, and the president replied: "Let the thing be pressed." It was, and Lee surrendered to Grant at Appomattox Court House on April 9. Analysis: On April 6, cavalry under Phil Sheridan effectively cut off three corps of Lee's army, near Marshall's Crossroads while the Union Second and Sixth Corps approached from the east. In three distinct engagements, the Federals overwhelmed the defending Confederates, capturing some 7,700 men and depriving Lee of roughly one-fourth of his army. Among the prisoners were six Confederate generals including Richard S. Ewell, Joseph Kershaw, and Custis Lee, the commanding general's son. To President Jefferson Davis, Lee wrote, "a few more Sailor's Creeks and it will all be over." On the rainy morning of April 6, skirmish fire announced that Andrew Humphreys' Union Second Corps had spied Lee's move and was now in pursuit. 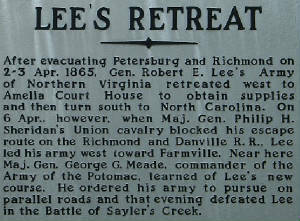 At the same time, Phil Sheridan's cavalry rode parallel to Lee's line of retreat, launching hit-and-run strikes on the Rebel column. Also fighting at Sailor's Creek was Navy Commander John Randolph Tucker and his squadron of 300–400 sailors. Farther away, II Corps pushed back Maj. Gen. John Brown Gordon, who had mistakenly been on a different road. Anderson and Ewell's troops halted at Holt's Corner to fend off the Federal attackers, thus creating a two-mile gap between Anderson and the nearest friendly unit. Into that gap George Custer thrust his horsemen, netting a number of artillery pieces in the vicinity of Marshall's Crossroads. Making matters worse, Ewell caught sight of another Federal corps—Horatio Wright's Sixth Corps—approaching from the east. With Yankee cavalry blocking the road to Farmville and infantry nipping at its heals, a sizable portion of Lee's army was caught in a vice that was threatening to crush them. Two divisions of Wright's Corps—those of Truman Seymour and Frank Wheaton—arrived on the farm of James Hillsman at around half past four. 1,100 yards away, on the other side of the stream was Ewell's force. Following orders from Phil Sheridan, Wright deployed twenty pieces of artillery in front of the Hillsman house and, at 5:15 PM, proceeded to shell the Rebel force. Unfortunately for Ewell, Confederate ordinance was in the wagon train with Gordon; the Confederates had no artillery with which to counter Wright's bombardment. After a thirty-minute cannonade, Wheaton's division stepped off from the Hillsman farm and waded into the rain-swollen waters of Little Sailor's Creek. Once on the other side, the Federals dressed their lines and continued their assault. Ewell's defenders let loose a volley that staggered a portion of the attacking force, sending them bolting to the stream for cover. Confederate General Stapleton Crutchfield seized this opportunity and led an impetuous counterattack spearheaded by his heavy artillery battalions. These artillerymen acting as infantry became embroiled in savage hand-to-hand combat that claimed the life of Gen. Crutchfield, who was shot through the head. Union artillery came up in support and canister drove the Confederates back to their lines. By now Seymour's Federals had also crossed the stream and were advancing on Ewell's left. The pressure of Seymour's and Wheaton's attacks was too much for the Confederates to bear. After another brutal melee, Ewell's men began to surrender. At Marshall's Crossroads, Anderson was faring no better. Wesley Merritt's Union cavalry pressed the Confederates on both flanks. Custer ordered a series of mounted assaults on the Confederate left division while George Crook's dismounted attacks put pressure on Anderson's right. Custer's horsemen eventually broke through the Confederate line and Anderson's men began rushing for the rear or surrendering. Watching the battle from a distant knoll, Robert E. Lee was heard to exclaim, "My God! Has the army dissolved?" On the evening of April 6, Phil Sheridan wrote of his success to Grant saying, "If the thing is pressed I think that Lee will surrender." When word of this reached Abraham Lincoln, the president responded, "Let the thing be pressed." Lee and the 28,000-man Army of Northern Virginia would surrender to Grant, commanding an army that had swelled to more than 100,000 effectives, just three days later at Appomattox, Virginia. April 6, 1865, 12 p.m. Union cavalry under Charles Smith attack Confederate general Richard H. Anderson's Fourth Corps at Holt's Cross Roads east of Sailor's Creek as it retreats west from Petersburg. Anderson is forced to stop and fight, dangerously separating his men from Longstreet's column. April 6, 1865, 2 p.m. George A. Custer's Union cavalrymen exploit a gap in the lines of retreating Confederate forces, attacking near Marshall's Crossroads west of Sailor's Creek. Custer captures some artillery and pins Richard Anderson's Fourth Corps in place. Two Confederate corps under James Longstreet march on to the west, unaware of Anderson's predicament. April 6, 1865, 4:30–6:30 p.m. The slow-moving supply wagons following General Richard S. Ewell that detoured north and were protected by John B. Gordon's corps, are attacked by the Union Second Corps near the Lockett Farm. The wagons have difficulty crossing Sailor's Creek, resulting in the capture of more than 1,700 of Gordon's men, in addition to 300 wagons and 70 ambulances. April 6, 1865, 5:00–6:30 p.m. Union general Wesley Merritt's cavalry attacks and routs Confederate general Richard H. Anderson's corps at Marshall's Crossroads west of Sailor's Creek. The pell-mell retreat results in 2,600 of Anderson's men being captured, including four generals: Richard S. Ewell, Theodore Brevard, Montgomery D. Corse, and Eppa Hunton II. 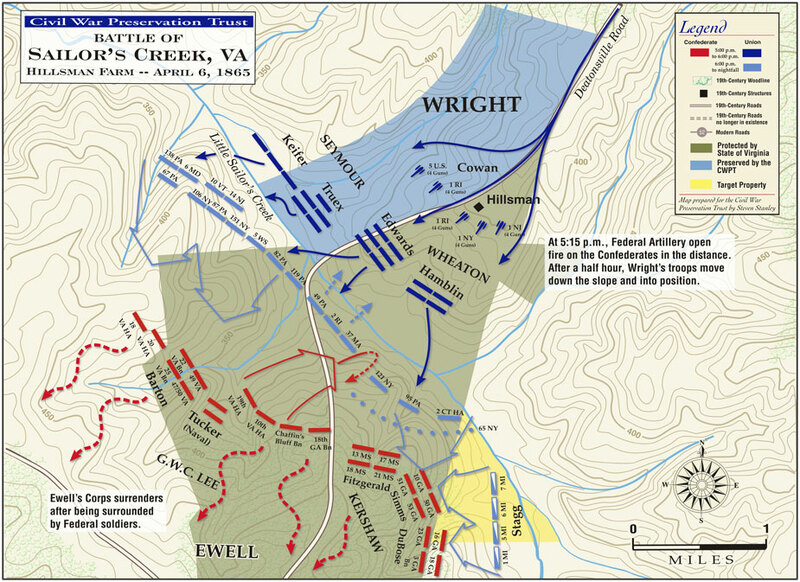 April 6, 1865, 5:15–6:30 p.m. Union general Horatio G. Wright's Sixth Corps attacks Richard S. Ewell's reserve corps across the rain-swollen Sailor's Creek. Hand-to-hand fighting ensues before the Confederate line breaks and nearly 3,400 men surrender, including five generals, one of whom is Robert E. Lee's eldest son: George Washington Custis Lee. April 6, 1865, 6:15 p.m. Confederate general Robert E. Lee, who has been traveling with James Longstreet's corps, views the disaster at Sailor's Creek from a distant ridge. Nearly 20 percent of the Army of Northern Virginia is killed, wounded, or captured, with nine generals taken prisoner. "My God!" he exclaims. "Has the army been dissolved?" April 7, 1865. 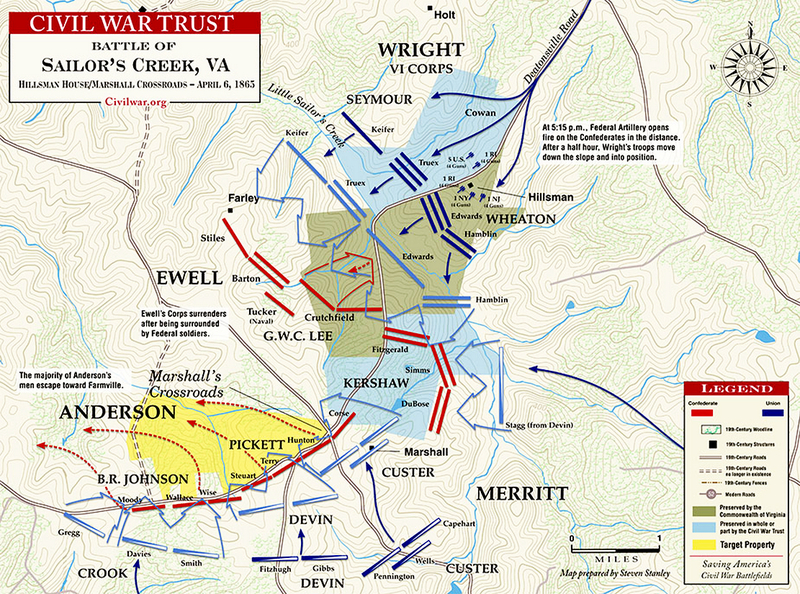 After a disastrous series of battles near Sailor's Creek in which 7,700 Confederates are captured, including nine generals, Robert E. Lee relieves Confederate generals Richard H. Anderson, Bushrod R. Johnson, and George E. Pickett of duty, although Pickett continues with the army to Appomattox Court House. Sources: National Park Service; Freeman, Douglas S. Lee's Lieutenants: A Study in Command. 3 vols. New York: Scribner, 1946; civilwar.org (Civil War Trust); Library of Congress; Sailor's Creek Battlefield Historical State Park; Bearss, Edwin C., with Bryce A. Suderow. The Petersburg Campaign. Vol. 2, The Western Front Battles, September 1864 – April 1865. El Dorado Hills, CA: Savas Beatie, 2014. ISBN 978-1-61121-104-7; Calkins, Chris. The Appomattox Campaign, March 29 – April 9, 1865. Conshohocken, PA: Combined Books, 1997. ISBN 978-0-938-28954-8; Calkins, Chris M. Thirty-Six Hours Before Appomattox: April 6 and 7, 1865: The Battles of Sayler's Creek, High Bridge, Farmville and Cumberland Church. Farmville, VA: Farmville Herald, 1980. OCLC 7216968; Davis, Burke. To Appomattox: Nine April Days, 1865. New York: Eastern Acorn Press reprint, 1981. ISBN 978-0-915992-17-1. First published New York: Rinehart, 1959; Eicher, David J. The Longest Night: A Military History of the Civil War. New York: Simon & Schuster, 2001. ISBN 978-0-684-84944-7; Freeman, Douglas S. Lee's Lieutenants: A Study in Command. 3 vols. New York: Scribner, 1946. ISBN 0-684-85979-3; Greene, A. Wilson. The Final Battles of the Petersburg Campaign: Breaking the Backbone of the Rebellion. Knoxville: University of Tennessee Press, 2008. ISBN 978-1-57233-610-0; Hess, Earl J. In the Trenches at Petersburg: Field Fortifications & Confederate Defeat. Chapel Hill: University of North Carolina Press, 2009. ISBN 978-0-8078-3282-0; Horn, John. The Petersburg Campaign: June 1864-April 1865. Conshohocken, PA: Combined Publishing, 1999. ISBN 978-0-938289-28-9; Humphreys, Andrew A., The Virginia Campaign of 1864 and 1865: The Army of the Potomac and the Army of the James. New York: Charles Scribners' Sons, 1883. OCLC 38203003; Long, E. B. The Civil War Day by Day: An Almanac, 1861–1865. Garden City, NY: Doubleday, 1971. OCLC 68283123; Longacre, Edward G. The Cavalry at Appomattox: A Tactical Study of Mounted Operations During the Civil War's Climactic Campaign, March 27 – April 9, 1865. Mechanicsburg, PA: Stackpole Books, 2003. ISBN 978-0-8117-0051-1; Longacre, Edward G. Lee's Cavalrymen: A History of the Mounted Forces of the Army of Northern Virginia. Mechanicsburg, PA: Stackpole Books, 2002. ISBN 978-0-8117-0898-2; Marvel, William. Lee's Last Retreat: The Flight to Appomattox. Chapel Hill: University of North Carolina Press, 2002. ISBN 978-0-8078-5703-8; Salmon, John S., The Official Virginia Civil War Battlefield Guide, Stackpole Books, 2001, ISBN 978-0-8117-2868-3; Trudeau, Noah Andre. The Last Citadel: Petersburg, Virginia, June 1864–April 1865. Baton Rouge: Louisiana State University Press, 1991. ISBN 978-0-8071-1861-0; Trudeau, Noah Andre. "Out of the Storm: The End of the Civil War, April–June 1865. Boston, New York: Little, Brown and Company, 1994. ISBN 978-0-316-85328-6; Weigley, Russell F. A Great Civil War: A Military and Political History, 1861–1865. Bloomington and Indianapolis: Indiana University Press, 2000. ISBN 978-0-253-33738-2. Subjects: Battle of Sailor's Creek, Sayler's Creek Battlefield Map, Civil War, General Lee, General Sheridan, General John Gordon, Confederate Army surrendered, Union general Grant, Appomattox Campaign History, Facts, Summary, Historical Marker, Civil War Soldiers, Sailor's Creek Battlefield Historical State Park.